Without structural reforms to raise savings, reduce dependency on energy imports and improve the investment climate, Turkey ́s potential growth rate will likely decrease to 3% - 3.5% per annum. Nature of regime: Republican parliamentary democracy and secular state. The armed forces still have some political influence. The general elections in June 2011 delivered a clear victory for the religiously conservative Justice and Development Party (AKP), although with a reduced parliamentary majority: 327 of the 550 seats. As a result, the AKP rules with an absolute majority for the third consecutive term. However, it failed to reach a two thirds majority in parliament: the threshold for constitutional amendments. The nationalist Republican People’s Party CHP and the pro-Kurdish Peace and Democracy Party gained additional seats but remain in opposition, as does the far-right National Movement party MHP. In recent years, the AKP government has been successful in gradually curbing the army’s political powers and increasing control over the courts. A comprehensive reshuffle of the top military leadership has further strengthened the position of civilian rule and especially that of former prime minister and now president Erdogan. However, what some see as Erdogan pressing his own pro-Islamic ideology has annoyed a growing section of the population, especially in the cities. The protests sparked in Istanbul in the summer of 2013 were a reflection of this growing discontent and, while Erdogan prevailed in the first direct presidential elections held in August this year, he gained just 52% of the votes. Because of very slow progress of the accession talks between Turkey and the EU, earlier widespread popular support within Turkey for EU accession has faded. While the AKP under Erdogan at first pressed hard for negotiations, it has now partially shifted its foreign policy and is focused on relationships with the Middle East and Central Asia: aiming to strengthen political and economic ties and grow its influence in those regions. However, the formerly good relations with Israel have deteriorated because of differences over the Palestinian conflict and the regime change in Egypt. Turkey has taken a clear anti-Assad stance in the Syrian civil war and firmly supports the opposition forces. This is no doubt why the Syrian government has resumed its tacit support of the Kurdistan Workers´ Party (PKK). Compounded by Ankara’s tougher stance on the Kurdish question, this has led to renewed violent clashes between the PKK and Turkish forces since July 2012. Turkey’s anti-Assad stance has also damaged its relations with neighbouring Iran. Meanwhile, geopolitical risks have increased significantly in 2014 due to the rapid gains of the jihadi group Islamic State (IS) in neighbouring Iraq (Turkey´s second largest export market) and Syria. Consequently, the security situation has deteriorated in the south eastern part of the country due to a massive inflow of refugees from Syria and fighting close to the border. The ambivalence of Turkey to the US-led coalition against IS has raised tensions with the US and the EU. This has much to do with Turkey’s internal politics: mainly the fear that the PKK´s political and military clout will increase as a consequence of the ongoing conflict in Syria. 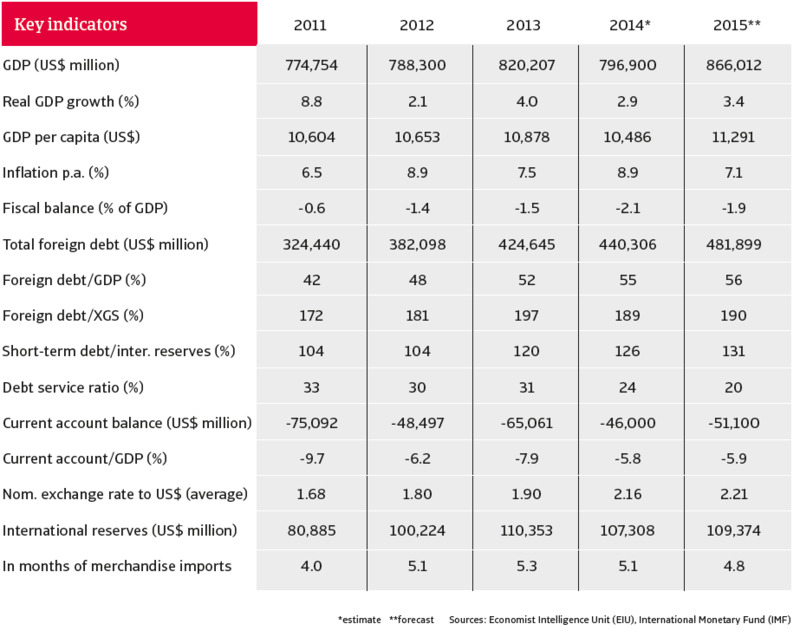 In the last decade, Turkey has made impressive economic progress. With political stability since 2002, when the AKP came to power, the country has experienced GDP growth exceeding the European average, while real per capita income has increased markedly. A fast growing population of more than 75 million and rising prosperity have turned Turkey into one of the most prominent of emerging markets. However, since 2013 Turkey’s structural economic weaknesses have resurfaced: among them its stubbornly high inflation, large gross external financing needs, heavy reliance on volatile portfolio capital inflows and relatively weak international liquidity – coupled with increased political risks. The Turkish currency depreciated sharply in 2013 when investors withdrew money from those emerging markets deemed most vulnerable to the eventual withdrawal of US monetary stimulus. As a result, Turkey faced widening current account deficits and a plunging currency that put them in the so –called “Fragile Five” alongside India, Indonesia South Africa and Brazil. 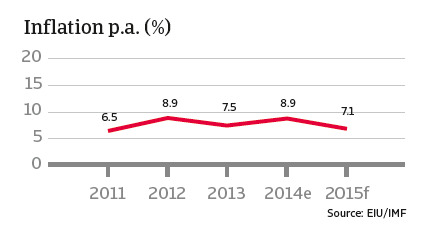 Following a pronounced economic slowdown in 2012, Turkey’s GDP rebounded in 2013, by 4.0%. However, the economy has lost steam again this year due to lower export growth and decreasing private consumption and investment, both constrained by higher lending rates and a depreciated currency that made imports more expensive. In Q2 economic growth slowed to 2.1% year-on-year and even contracted 0.5% compared to the previous quarter. Overall this year, economic growth of just 2.9% is expected. Turkey suffers from structural economic bottlenecks. It is a net energy/commodity importer and is therefore very vulnerable to the development of world market prices: a situation exacerbated by the volatility of the Turkish lira. This is contributing to structurally high inflation, which is expected to reach almost 9% in 2014, way above the central bank´s target rate of 5%. 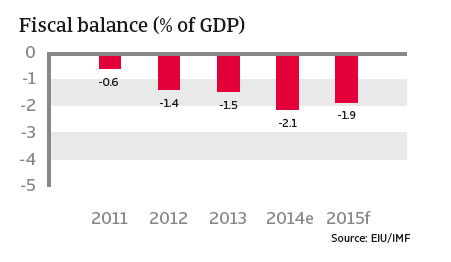 Public finances are sound, with small deficits of around 2% of GDP in 2014 and 2015. Public sector debt remains moderate at 40% of GDP. However, there is growing concern over the direction of economic policy. In January 2014, with the lira plunging, the central bank raised the benchmark interest rate to 10% (from 4.5%). Uncertainty about Turkish economic policy grew as the central bank cut interest rates – to 8.25% - in the run up to the August 2014 presidential elections, despite above-target inflation (over 9% against a target of 5%) and ongoing currency depreciation. This has raised doubts about the independence of the central bank, as the Turkish government had repeatedly voiced its desire for low borrowing costs to spur growth. It seems that the central bank has bowed to political pressure and this will probably not dissipate before the general elections due in June 2015. In general, the pace of reform of the labour market, social security and tax administration is still too slow to tackle structural unemployment and widespread ‘informal’ economic activities. Moves to privatise state banks and the power sector are also proceeding too slowly. 95% of oil has to be imported. Turkey has large lignite reserves. Hydro-electricity has a 28% share of electricity production. 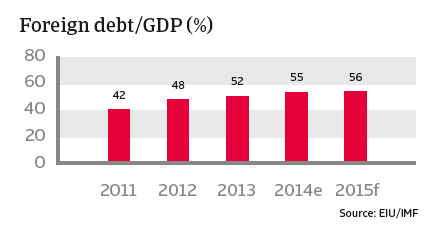 Debt service ratio: In 2014 quite high, at 24%, but expected to decrease to 20% in 2015. Remarks: Around two thirds of foreign debt has been incurred by the private sector. Still sufficient, ca. US$ 107 billion / 5 months of import cover in 2014, but tight in terms of coverage of external financing requirement and stock of portfolio inflows. Net foreign assets have weakened considerably. The Turkish economy´s Achilles heel remains the persistent current account deficits and their financing by portfolio inflows and debt. 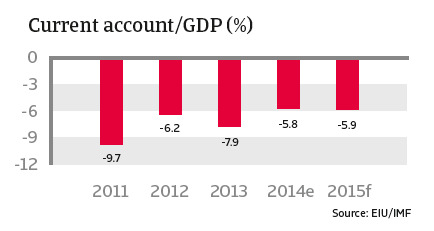 In 2014 and 2015 the current account deficit is expected to improve (helped by lower energy prices) but to remain high, at slightly below 6% of GDP, as the savings ratio remains low. Increasing foreign debt and substantial capital imports (foreign direct investment and portfolio capital) are needed to cover its high current account deficit. However, as much of that deficit is financed from volatile short-term portfolio investment, this makes the economy very vulnerable to any shake-up of negative sentiment in financial markets, which could trigger a massive withdrawal. As a result, the lira is very vulnerable, added to which is the growing uncertainty about the independence of the central bank in decisions on monetary policy, as seen in the run-up to this year’s presidential elections. The lira has depreciated by around 20% in nominal and 10% in real terms against the US$ since May 2013, when the US Federal Reserve began phasing out its expansionary monetary policy and investors subsequently withdrew their short-term capital from Turkey and other emerging markets. In the next parliamentary elections, scheduled for 2015, the AKP has a good chance of again prevailing as the opposition parties remain weak and divided and provided that the different factions within the AKP (hardliners and more reformminded members) stay together. A key question is whether the AKP will be able to secure a two thirds majority and amend the constitution to increase the powers of the presidency. If not, the AKP will most likely need the support of the Kurdish parliamentarians for any constitutional amendments. Moreover, such support will depend on whether peace talks with the PKK remain on track or whether events in Syria derail the peace process. Since there is no sign of an end to the Syrian civil war and the political situation in Iraq will remain highly unstable, the security situation on Turkey´s southern and eastern borders will remain tense for the time being. 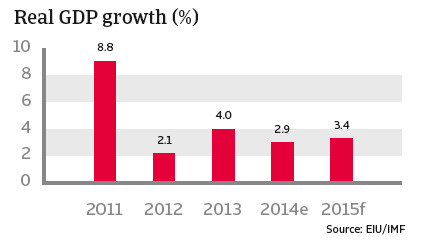 Economic growth is expected to increase to 3.4% in 2015. Growth in the coming months will be supported by accommodative fiscal policy, the recent interest rate cuts and a rise in foreign demand triggered by the weaker lira. Much depends on future developments in the Eurozone, which accounts for nearly 50% of Turkey’s exports and is the main source of capital investment. Turkey’s structural problems will for now persist: while inflation is expected to decrease to 7% next year, it remains stubbornly high, as does the current account deficit, at 6% of GDP. As a consequence, the country is still very reliant on financial markets to cover its large finance gaps and is therefore vulnerable to adverse market sentiment. As mentioned, much of the required capital investment is short term and therefore volatile, and this could also lead to more fluctuations in the lira exchange rate. That said, solvency remains reasonable for the time being. Only a massive lira depreciation by up to 30% in real terms would seriously threaten Turkey’s external debt sustainability, and this is not expected within the next 12 months. The future earnings capacity of the Turkish economy is constrained by macroeconomic imbalances related to high credit growth, high inflation and a large external deficit, coupled with structural issues related to its low savings rate and weaknesses in competitiveness, limiting FDI inflow. The investment climate is also hampered by a weak judicial system and an inflexible labour market. Without structural reforms to raise savings, reduce dependency on energy imports and improve the investment climate, Turkey´s potential growth rate will decrease to 3% - 3.5% per annum. However, no major structural reforms are expected ahead of next June’s general elections. The banking sector is still robust, with a high capital adequacy ratio of about 16% (September 2014), healthy profitability and a transparent loan portfolio. Non-performing loans remained stable at 2.9% in September 2014. But the finance sector is exposed to exchange rate and refinancing risks (see above) both directly and through the corporate sector. 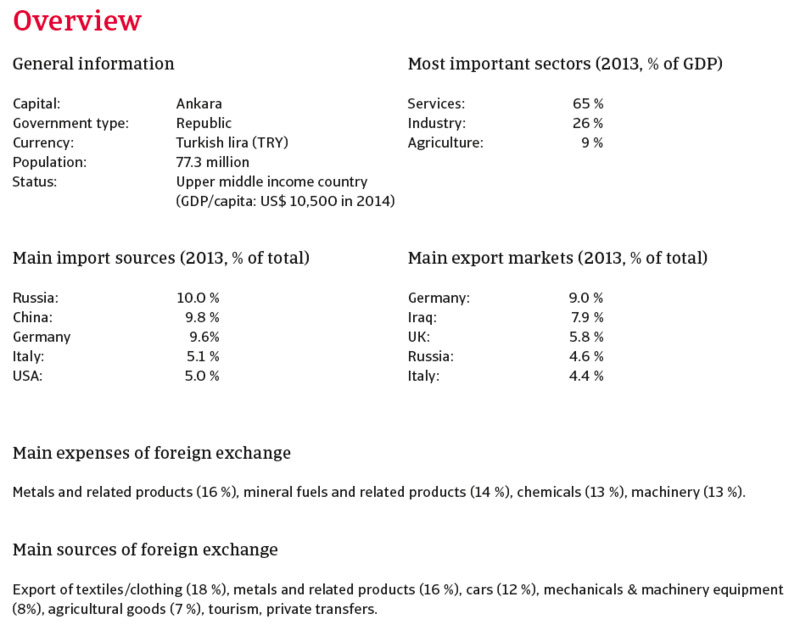 Turkey’s second largest export sector and an important customer of several other industries. Production in both the vehicle and spare parts segments has increased significantly since 2010, due mainly to foreign demand. Increased demand from the automotive, machinery and construction industries, together with the overall economic growth in recent years, has helped the sector. Still particularly vulnerable, due to a combination of excess capacity, lack of branded production, low capitalisation, decreasing domestic and export demand, competition from the Far East, and a non-performing bank loans ratio of around 7%. While pharmaceutical production and distribution remain stable and strong subsectors, the plastics subsector faces similar structural problems to the textile sector.